In a sign that I *may* have too much time on my hands (or that I was avoiding doing something productive), I typed up a menu for our Hasegawa Happy Hours. And when I say “typed” I mean typed on the typewriter because that’s how I roll. 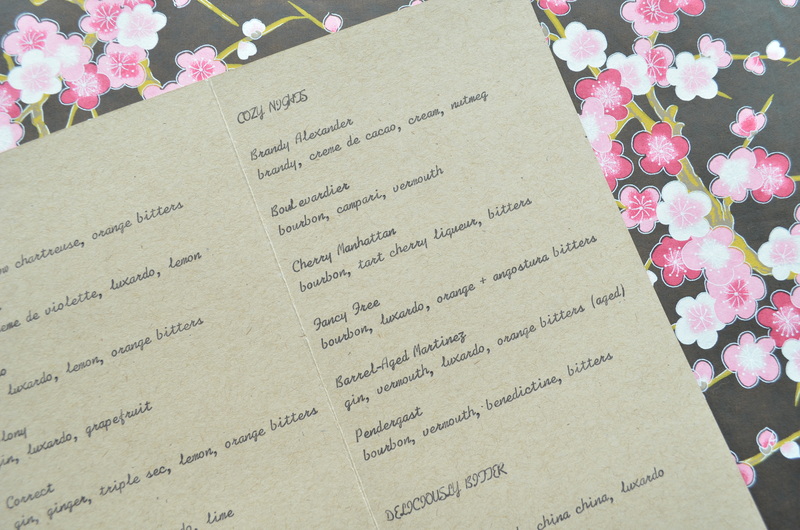 I know a menu seems weird and excessive, but honestly, if I didn’t have a set cocktail planned for our HHH guests, I was looking through my archives for suggestions. This way, I have all of my favorites in one place. 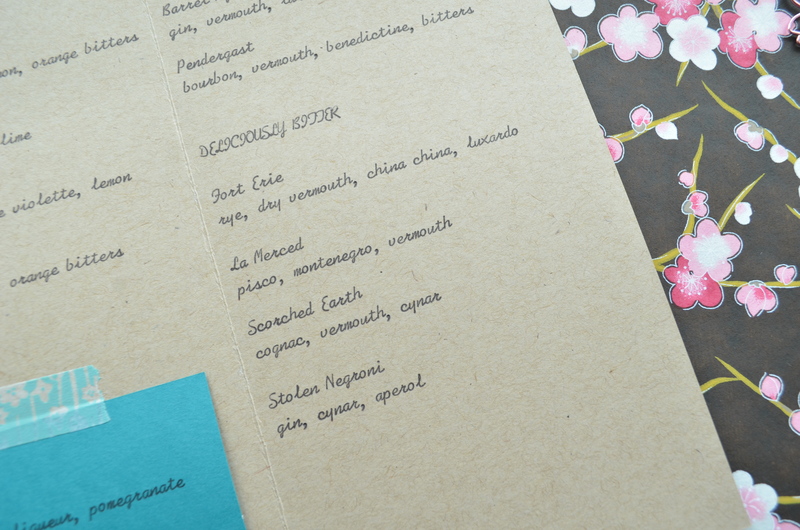 I typed the menu on a piece of 8.5×11 card stock scored and folded the long way. It’s very simply “formatted” since it was done on the typewriter and it’s spring-centric, which means I can type up another one for summer (ooh, for balcony cocktails! I can’t wait!) 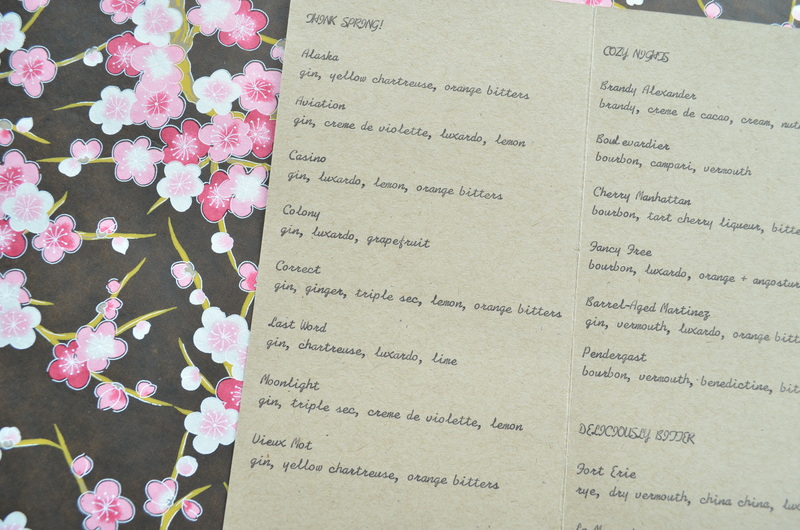 I have a section for “Think Spring” cocktails, which are coincidentally all gin-based. (Eagle eyes will notice that I messed up on the Vieux Mot and typed the wrong ingredients. Womp, womp.) Then there’s a section for “Cozy Nights” that includes mostly whiskey cocktails, perfect for right about now when it’s damp and cold outside. In the “Deliciously Bitter” section, I have a small list of bitter cocktails. I’ve added several bitter liqueurs to my collection this year and these four are tasty winners. 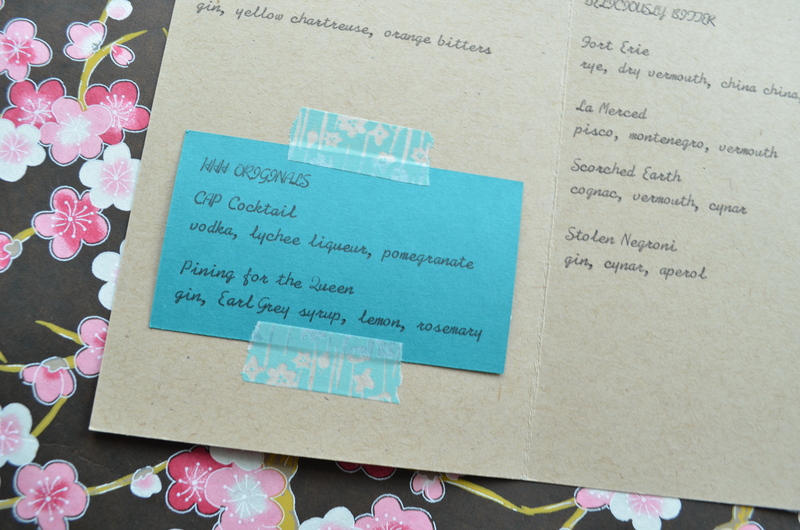 And, on a removable tiny business card, I typed up two Hasegawa originals, the CAP Cocktail and Pining for the Queen. It’s harder to keep those ingredients readily on hand around here, so I like to be able to remove the card if we don’t have any pomegranate juice or rosemary in the house. 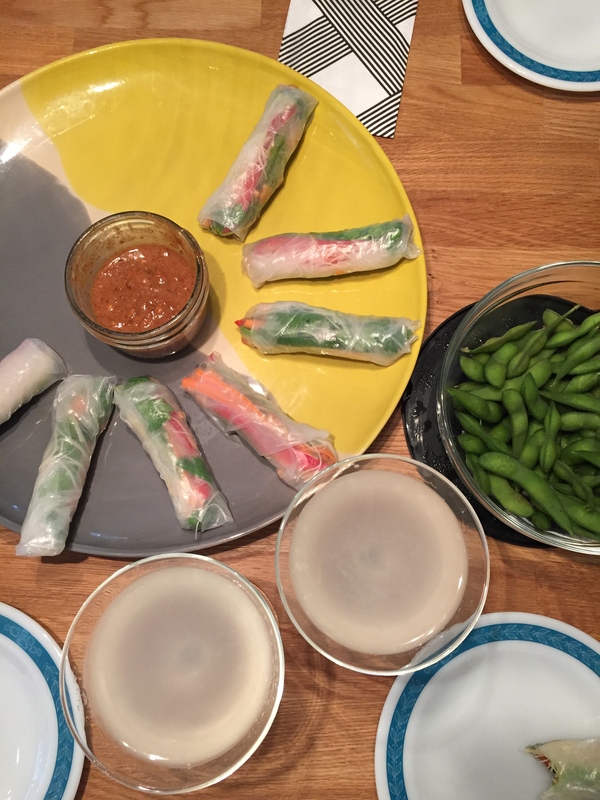 We tested the menu out last weekend when we had friends over for a little sushi-making party. It worked like a charm! 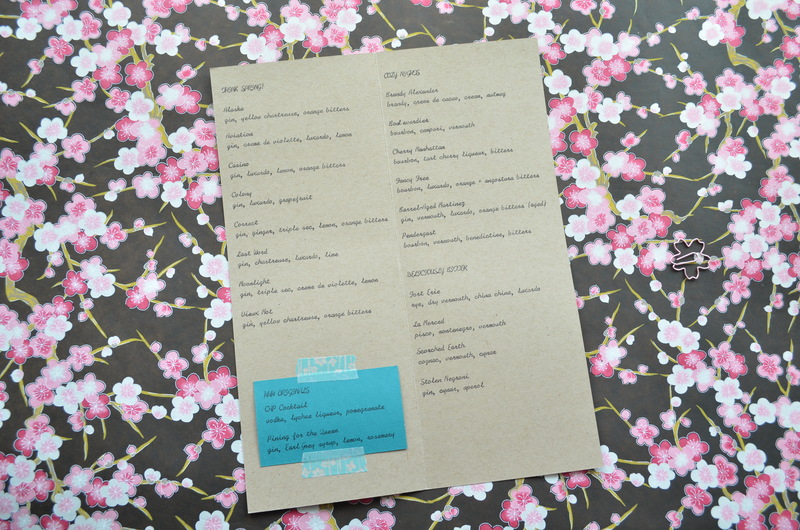 Such cute menu! 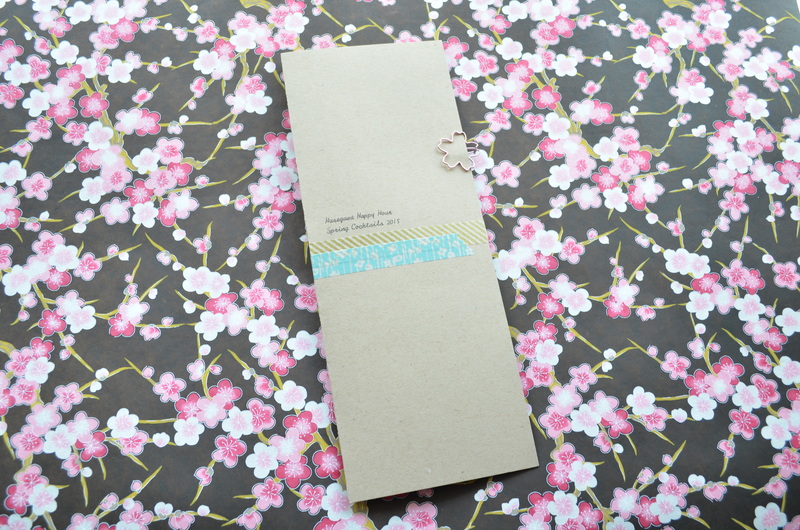 The Washi tape is a really lovely touch! 🙂 Mhmmm, those edamame beans! this is just toooooooo cute! Your original cocktails sound delish!